The government and aid groups rushed to bring food, water and shelter to the survivors as the government tried to ascertain just how many people were killed in the latest natural disaster to hit a country already reeling from nearly three decades of war. Figures on the number of people killed and missing in the disaster Friday varied from 255 to 2,700. Fears of a new landslide complicated rescue efforts, as homes and residents sat buried under meters (yards) of mud. That will be their cemetery,” said Mohammad Karim Khalili, one of the country’s two vice presidents, who visited the scene Saturday. “It is not possible to bring out any bodies. ” Though figures on the death toll varied, residents knew the toll the tragedy had taken on their own families. From atop a muddy hill, Begam Nesar pointed to the torrent of earth below that had wiped out much of her village. “Thirteen of my family members are under the mud,” she said, including her mother, father, brothers, sisters and children. She said she had been visiting relatives at a nearby village when the disaster struck. The United Nations said Friday at least 350 people died, and the provincial governor said as many as 2,000 people were feared missing. On Saturday, the International Organization of Migration said information they gathered indicated 2,700 people were dead or missing. Part of the confusion lay in the fact that no one knew how many people were home when the landslide struck. At least 255 people were confirmed dead, Khalili said. Most of those were people who had rushed to the scene to help after a previous, smaller landslide. When a bigger landslide hit, those people along with roughly 300 homes were wiped out. But since no one knows how many people were in those homes, counting the dead is difficult, Khalili said. The ground on a hill overlooking the village was soaked from recent heavy rainfalls that officials believe triggered the slide. About 1 kilometer (more than half a mile) away, government and aid groups set up tents for those displaced. Few had time to flee before the mud wall caved in. Sunatullah, a local farmer, was outside when he felt the earth start to move. He ran to his house, grabbed his wife and children and then ran to the top of a nearby hill. Minutes later, he said, part of the hill collapsed. “The houses were just covered in mud,” he said, adding that he had lost 10 members of his extended family, his house and his livestock. Authorities distributed food and water to survivors, said Abdullah Homayun Dehqan, the head of Badakhshan province’s National Disaster Department. But residents were worried about more natural disasters to come. “There are four valleys from where water can flow in here. If water flows in, the whole village would be under water,” said Jaan Mohammed. Rescuers have struggled to reach the remote area, roughly 320 kilometers (200 miles) from the capital, Kabul. There is little development or infrastructure. Even getting heavy equipment such as bulldozers to the site — accessible only by narrow and bumpy dirt roads — was difficult. Most residents live in single-story mud houses that were no match to the rush of earth. A spokesman for the US-led International Security Assistance Force said they have not received any requests to help out with the disaster. Badakhshan province borders Tajikistan to the north and China and Pakistan to the east. “Badakhshan is a remote, mountainous region of Afghanistan, which has seen many natural disasters,” said the head of the IOM’s Afghanistan office, Richard Danziger. “But the scale of this landslide is absolutely devastating, with an entire village practically wiped away. Hundreds of families have lost everything. 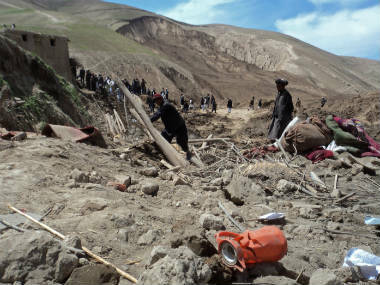 ” In addition to the wars and fighting that have plagued Afghanistan for roughly three decades, the country has been subject to repeated natural disasters including landslides and avalanches. A landslide in 2012 killed 71 people. Authorities were not able to recover the vast majority of bodies and ended up declaring the site a massive grave. This entry was posted in Asia Pacific and tagged afghanistan, Government, Land Slide, Mohammad Karim Khalili, Natural disaster, Natural Disasters, Village Wiped Out. Bookmark the permalink.